I wanted to write a post about the Dollar Shave Club. I have been using their razors for about one year now, and recently decided to do some research to see if it’s as good of a deal as they say it is. On the internet, people are wondering if Dollar Shave club is legit. I guess they’re looking at making the purchase and want to make sure that it’s not a waste of their money. There seems to be a lot of hype surrounding the company; mostly because of the excellent job they did on marketing their product. If we can learn anything from the Dollar Shave Club is that they did a great job with their marketing; mainly, their youtube video which went viral not long after they uploaded it. My purpose of this blog post is not to focus on their excellent marketing ability, but to answer everyone’s question – is Dollar Shave Club worth the money? That’s the purpose of this blog post, and I hope to answer that for you today. Again, I have been using their product for about a year, and I think it’s okay. What is my opinion of the quality of Dollar Shave Club’s razors? It’s a razor. I have been using their four blade razor and found that at times the new razors were not as sharp as they could have been.They are not terrible, but they are not the absolute best. I guess my final score in quality would be the razors were okay – just okay. Four blades will cost you $9 per month for the replacements. So push away all of the hype and fluff (that includes some of the sample creams, wipes, and even the razor handle), and focus on the replacement blades which is going to cost you $9 a month.So for $9 a month, you are going to get a six-blade razor with a trimmer edge, a pivoting head handle, and lubricating strips on the front of the razor for calming sensitive skin. All of this for $9 a month or about $2.25 per razor.What do you think about that price?It sure sounds like a good deal especially when you don’t have to keep ordering razors; the razors just appear at your front door every month without any effort at all. I enjoyed getting new razors every month by mail. The problem was I didn’t always use the razors that I received the month prior. At times, I would get razor boxes piled up because I had a slow month shaving. Now, you could pause your order, but that would take effort, right? I mean, what’s the point of having razors automatically delivered to you if you keep having to pause your order. Not everyone will find this a problem. There are some that will use all of the razors provided each month, but I think others will not. There are a lot of people that love the fact that it’s automatic; you don’t have to worry about forgetting to order new razors for that month, and that is indeed a selling point. So is Dollar Shave Club a steal? Is it worth buying?I did some digging around to see if I could find a better price than Dollar Shave Club on Amazon, and I was surprised what I found. Remember, Dollar Shave Club costs (For their executive razor, a set of 4 six-blade razors) $9 a month or $2.25 a razor. GUARANTEED – Try our SWIPE® Premium Razors with NO RISK and 100% Money Back – No Questions Asked. KIT INCLUDES – bulk razor 6-blade cartridges + free ergonomic non-slip handle. PREMIUM QUALITY – Precision-engineered blades for a very close, comfortable shave. TILT – Pivoting head allows you to follow the contours of your face & body. TRIMMER – Each cartridge includes one trimmer blade for precision cleanup. Also, each Amazon razor has a lubricating strip that will aid with a smoother shave and a pivoting razor head – the same as Dollar Shave Club. I liked the Amazon razors; I thought they were comparable to the Dollar Shave Club.And with Amazon’s subscription plans, you can also have your Razors delivered right to your door every 6 months. 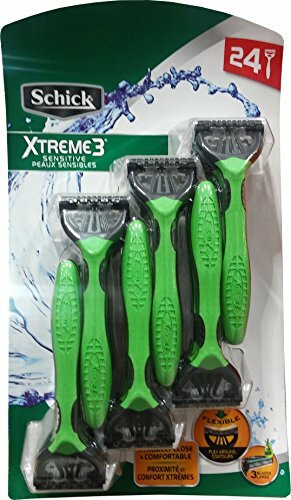 You can keep paying $2.25 for razors every month, or you can try the Amazon blades, and buy six months in advance for cheaper. The Dollar Shave Club razors do have a lot of hype, but are a decent razor. I just think you can get a comparable razor on Amazon for cheaper.Cheers.